Happy Monday everyone! Scrappin Toxic Midge here. I am not one of those people that love seeing Christmas items on the shelf in August. I love Thanksgiving and decorate for that holiday too. However, I do have a Christmas card to share with you today LOL I need a lot of them this year and needed to get started! Have an amazing and super crafty day! 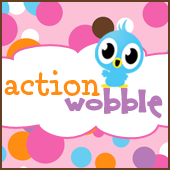 Action Wobble Design Team Call!